Journey To A(nother) Marathon: TOMORROW! Well, I'm here! I drove down to Chattanooga, checked into my hotel, picked up my race packet and found some food. Now I'm going to see if I can get some sleep. 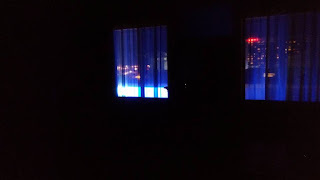 I'm excited and nervous, I don't think I'll sleep much from that, but then, my hotel room is just outside the convention center marquee and my room is full of bright blinking lights! We'll see if I can get any sleep at all! I ended up not running at all this week and only a couple times last week. I hope I didn't overdo the taper. I am worried I didn't train hard enough, long enough, that my long runs were horrible things that ended up slow as molasses. I'm worried I won't finish in the 7 hour time limit. I'm worried that I will trip and twist my ankle and have to stop. I'm just worried. And yet, it's just another long run, right? Better or worse, I get to run. And that's a blessing. Thank God that I can run.